ANALOG vs. DIGITAL: Yohji Yamamoto and adidas explore the future by looking back into the past. 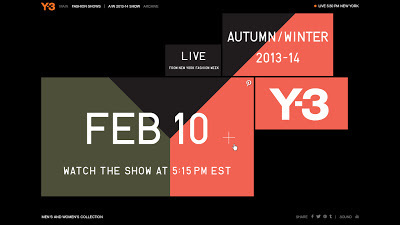 Y-3 will present its collection for fall/winter 2013 on Sunday, February 10 in New York. The atmosphere is set in an abandoned market hall in Manhattan’s Lower East Side. Continuing to mark its tenth year in existence, Y-3 further examines the effects of fashion on sport and sport on fashion. For the coming season this is reflected in the juxtaposition of Old vs. New, Underground vs. Establishment, Lo-Fi vs. Hi-Fi. Y-3 expands this short moment in time into an engaging Interactive Live Stream Experience: one fashion show with four different perspectives onto the runway. Front Row-Audience vs. Online-Audience. The online-audience can magnify one view at the time without losing the perspective of the show as a whole and get an exclusive insight of the backstage. Furthermore, online-users can live “shoot the look” to choose their personal highlight of the collection and pin it directly to their Pinterest boards. The live stream starts at 5:15 PM EST on Sunday, February 10. You'll can watch it on Y-3.com.